Want to spice up the party even more? Try this! 1. Heat oven to 375ºF. Stir together about half of the cake mix (dry), the shortening, butter, vanilla, egg and food color in large bowl thoroughly, using spoon. Stir in remaining cake mix. 2. Divide dough in half. Roll each 1/4 inch thick on lightly floured cloth-covered board, using cloth-covered rolling pin. 3. Cut into desired shapes with 2 1/2-inch cookie cutters; cutting out eyes, nose, etc., if desired, using sharp knife. Bake on ungreased cookie sheet 6 to 8 minutes or just until set (centers will be soft). Cool 1 minute before removing from cookie sheet. Immediately make hole in tops of some cookies, using end of plastic straw; trim any cut edges with sharp knife to straighten. Cool completely on wire rack. 4. Tie ribbon or yarn through holes to hang. 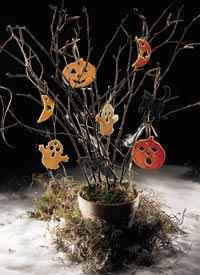 Hang ornaments on tree branches anchored in a pot or on Halloween tree (available at craft stores). Decorate remaining cookies as desired.